Teams also have admins which have the ability to add / remove members, and edit the name and description. To add a member as an admin, click on the button that says "Normal" to the right of the member's avatar in the member list on the team's profile, and select "Admin" in the Change Permissions drop down menu. On Business Class teams, team admins also have automatic board admin access to all team boards, even private team boards. 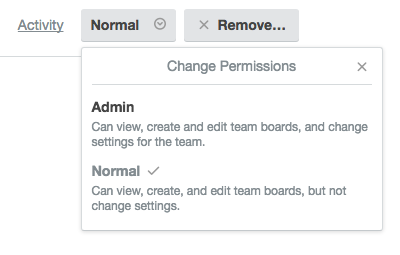 Set team member permissions to normal or admin.